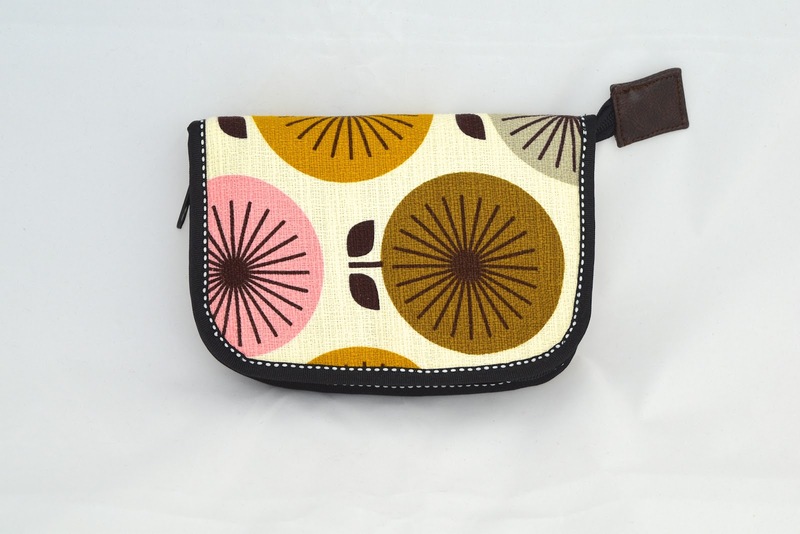 Today's pouch (or case) is a really simple one, and I'm including it for two reasons. 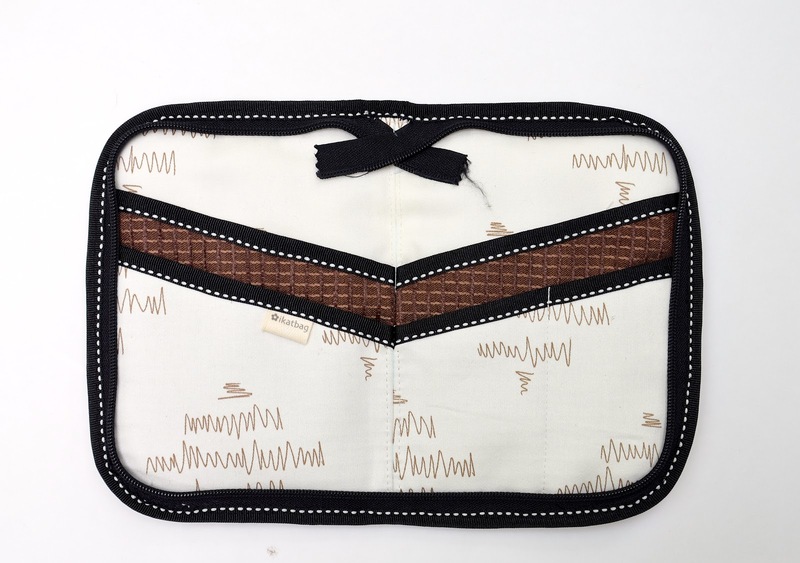 One, its edges are bound externally so, like this earlier utility case, all its layers are sewn together as one composite panel. 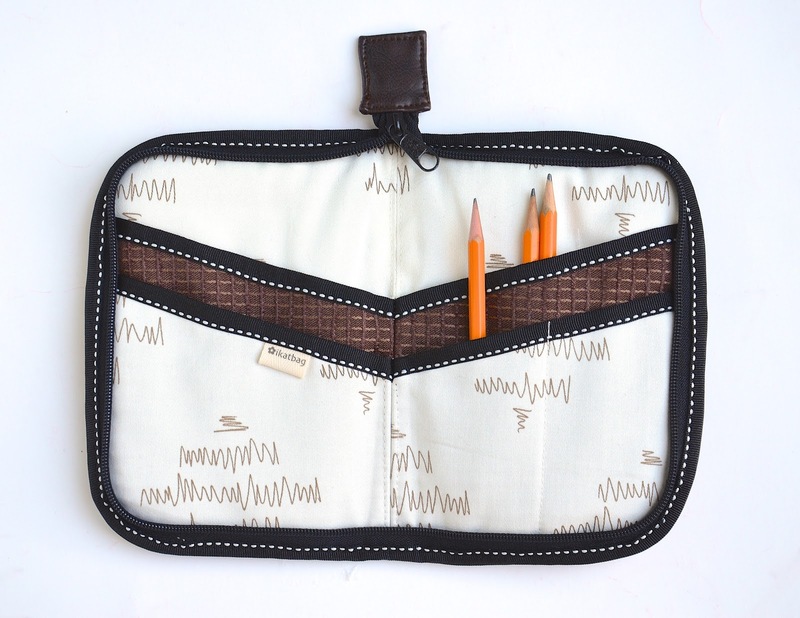 Anyway, I thought I'd do a tutorial of that method of zipper installation and make a pouch/case of it. You can choose to have the zipper tab on the top or bottom of the pouch/case. I put mine on the top so it could function as something to hold on to, as well. 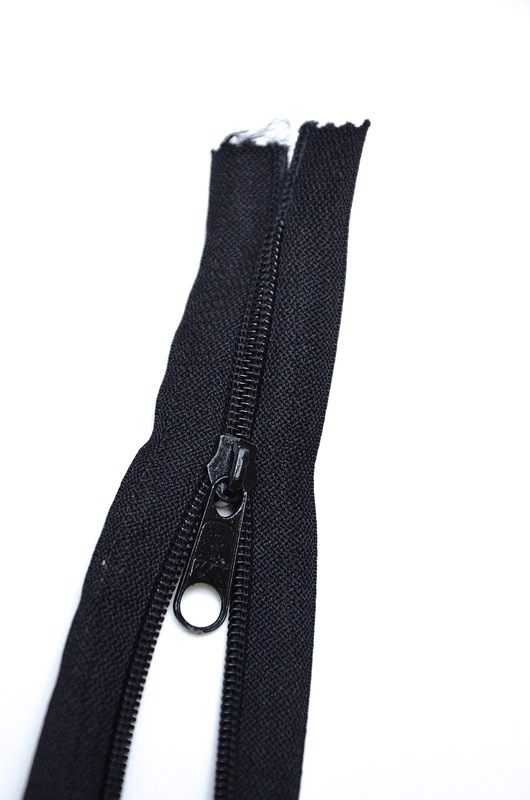 Here is the other "end" of the zipper - no stops, because there's nowhere else for the pull to go! 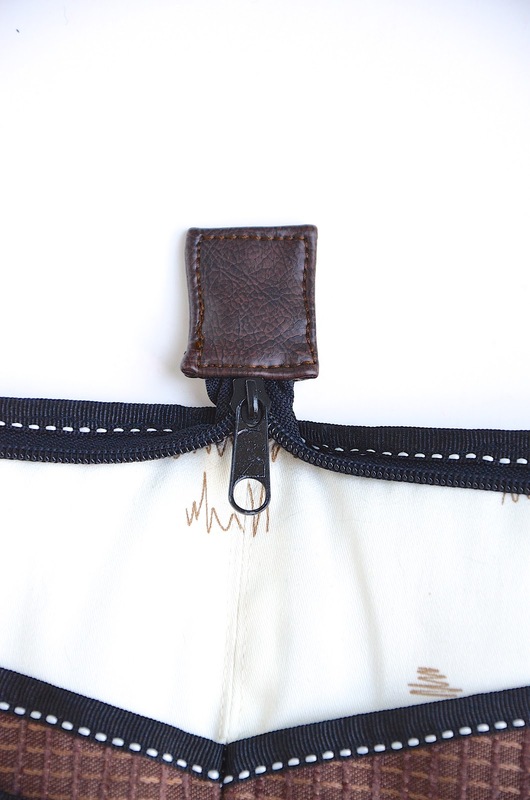 Before we begin the actual instructions, let's talk about the zipper: you'll need a long one. Really long. 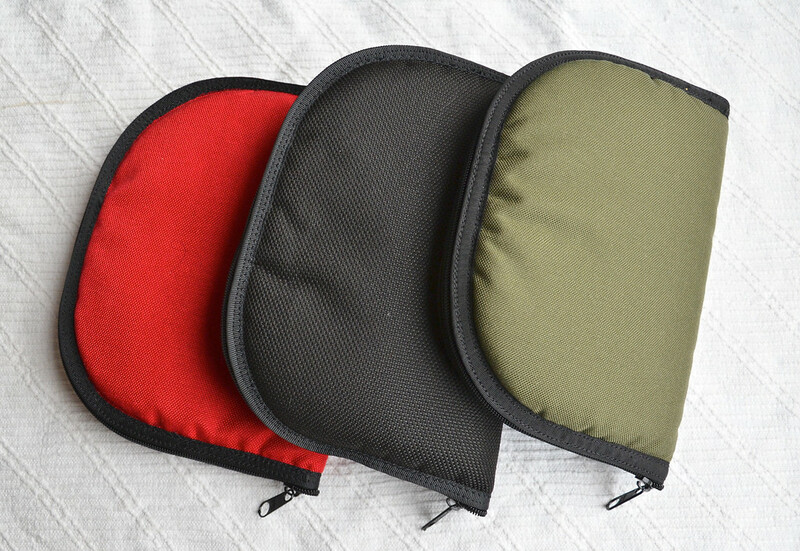 Long enough to go around the three zippered sides of your case twice. Then you'll need to take it apart. 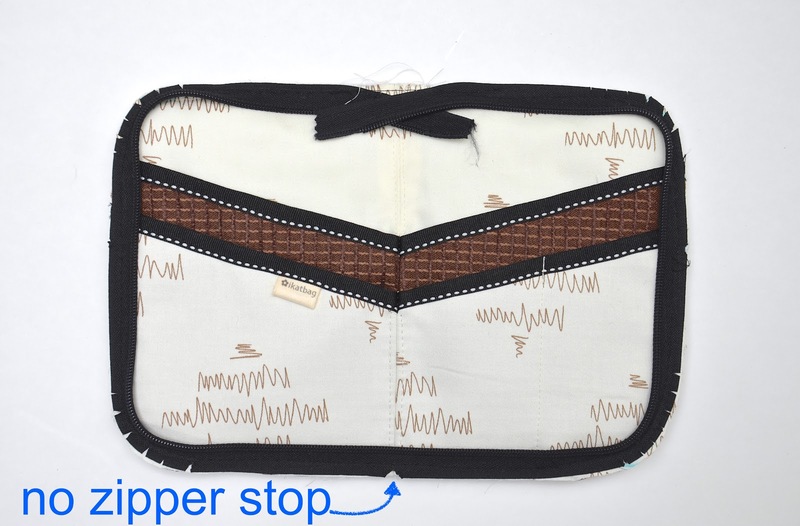 To do this, remove the bottom metal stop and slide the zipper pull completely off the coils. 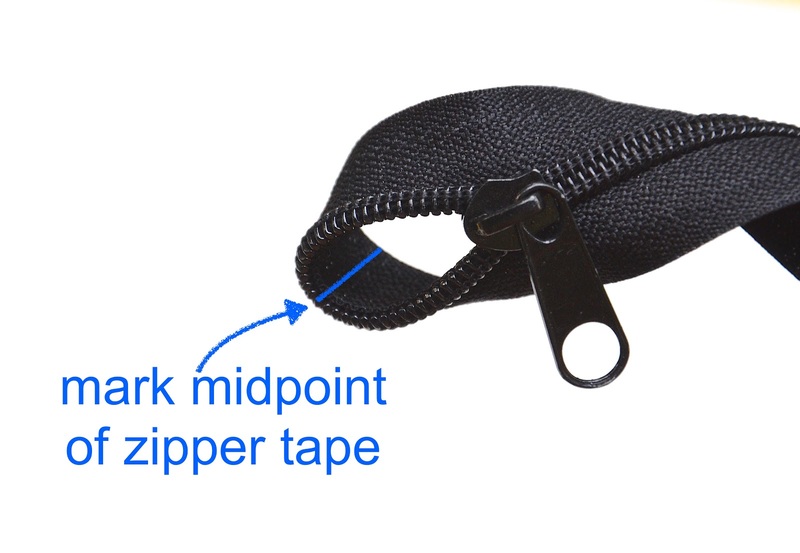 The two sides of the zipper tape will also separate completely. 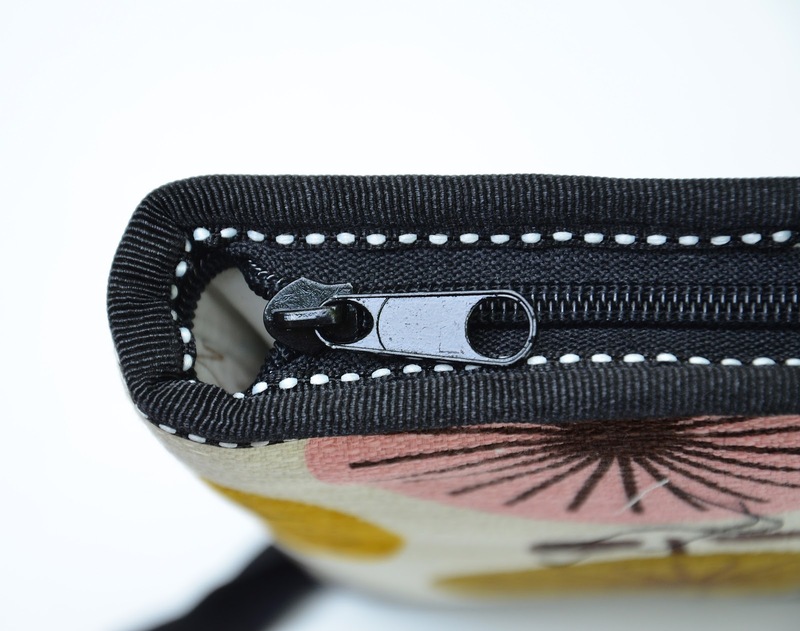 Then slide the zipper pull back on those two ends of the zipper tape. Practise this a bit, so you're comfortable doing it. 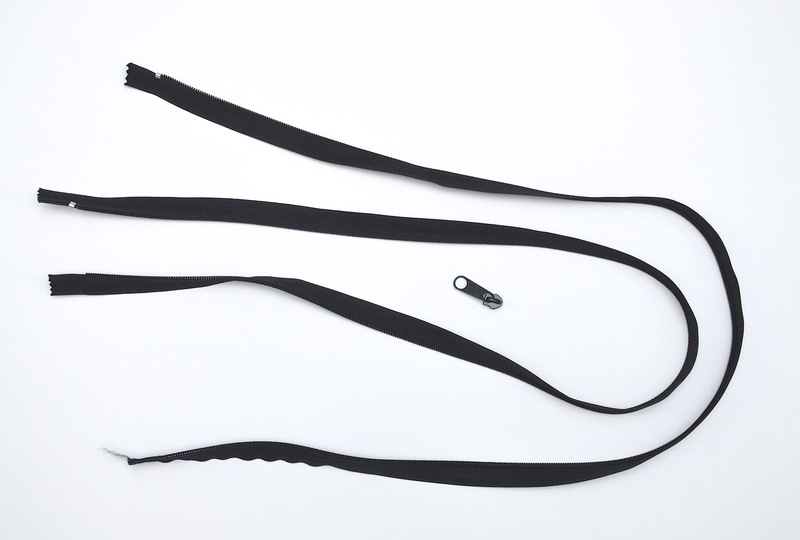 Now, because one side of this single zipper tape is upside down with respect to the other side, their coils line up a little oddly, so your resulting zipper might twist. This is okay. 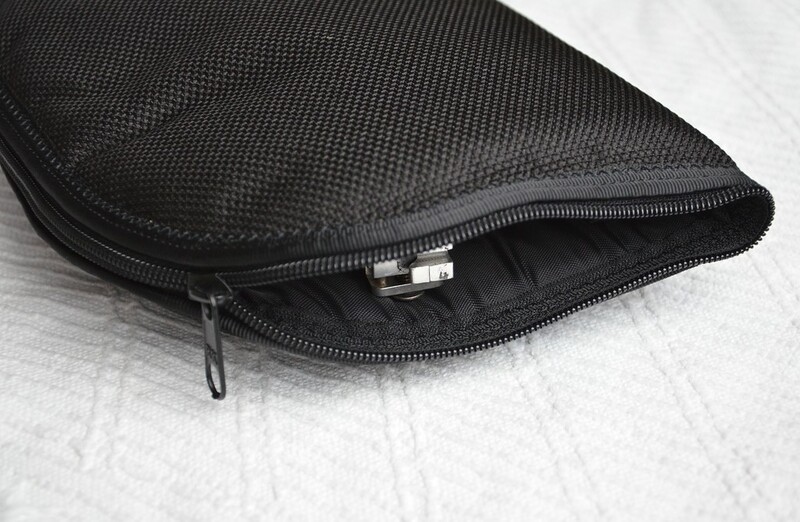 Once the zipper is installed in the case/pouch, it straightens out and sits flat. 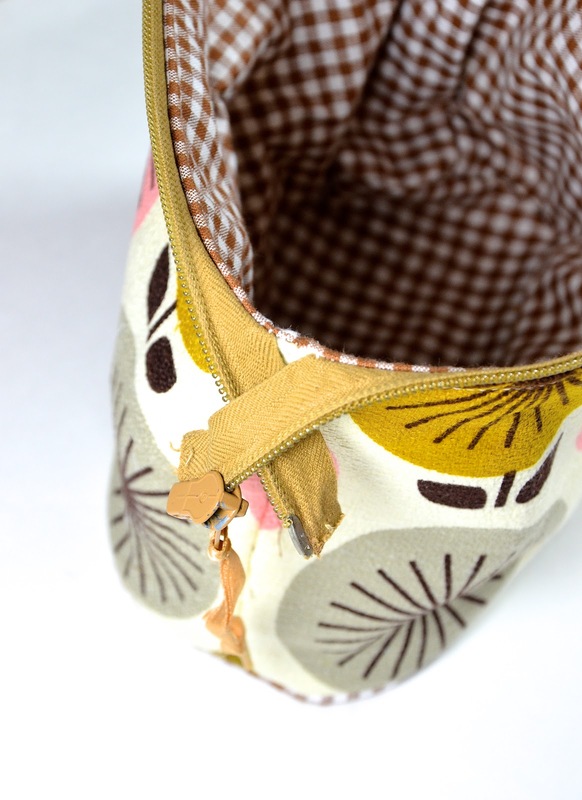 When you get to the 'end of the road', the zipper pull ends up in a cul-de-sac of sorts. 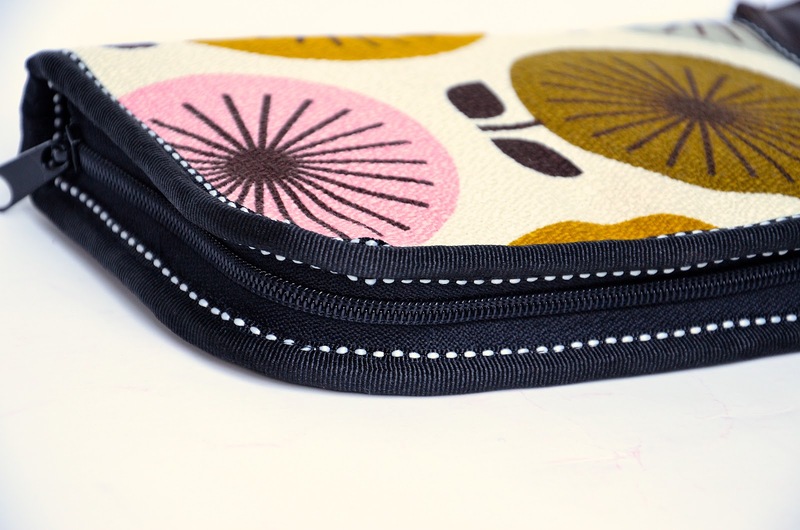 The outer and lining panels will be folded in half in the finished case. 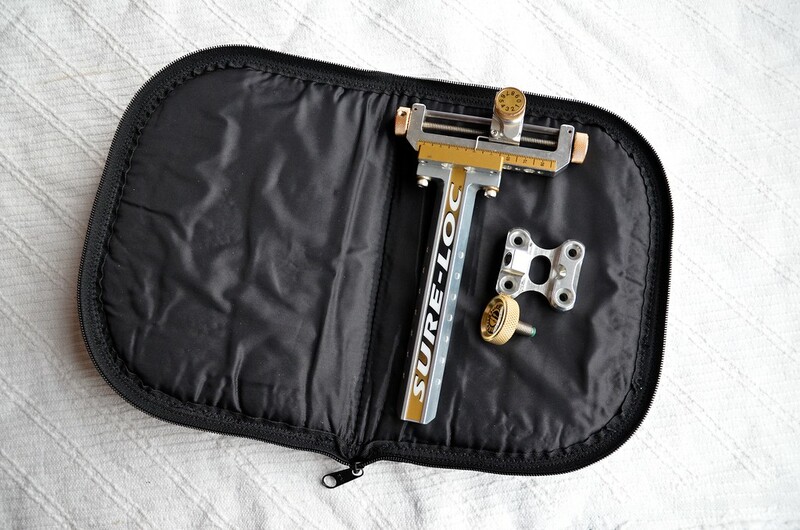 In addition to these three main players, you might want stabilizers, additional pockets and, of course, something to bind the SA with. 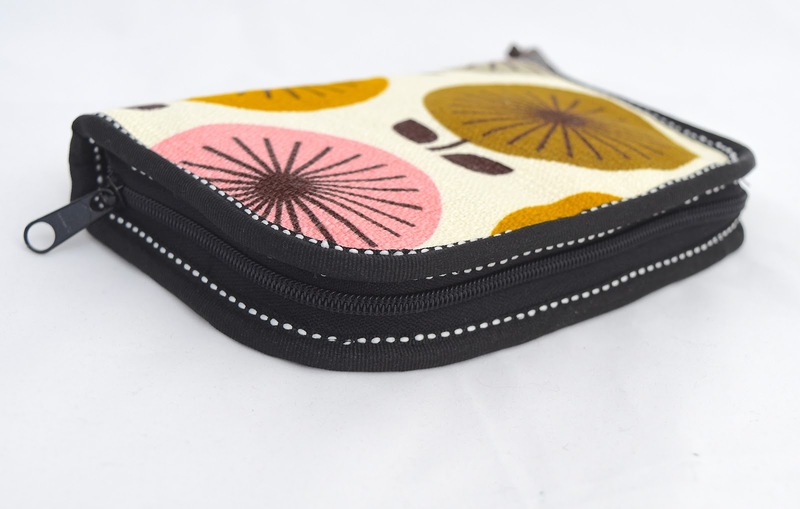 If you want internal pockets (which are useful because they increase the functionality of this pouch/case), sew them onto the RS of the lining piece first. 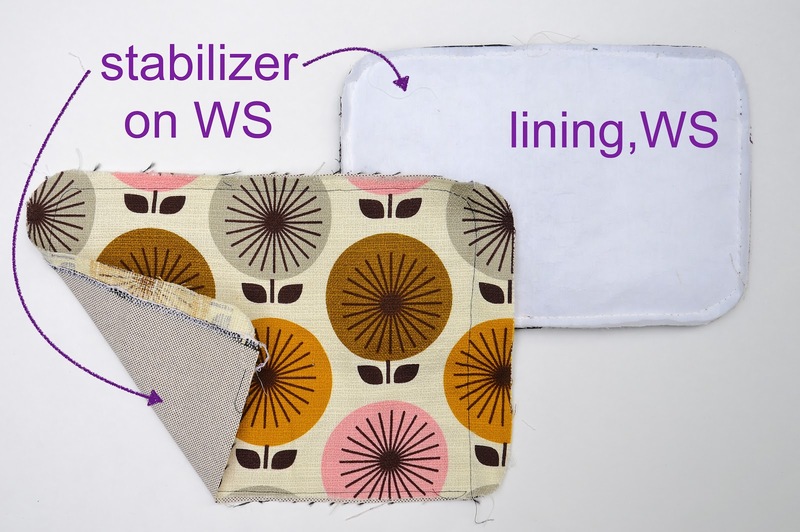 Then, with WS together, baste the outer to the lining piece to make one composite multi-layered body piece. 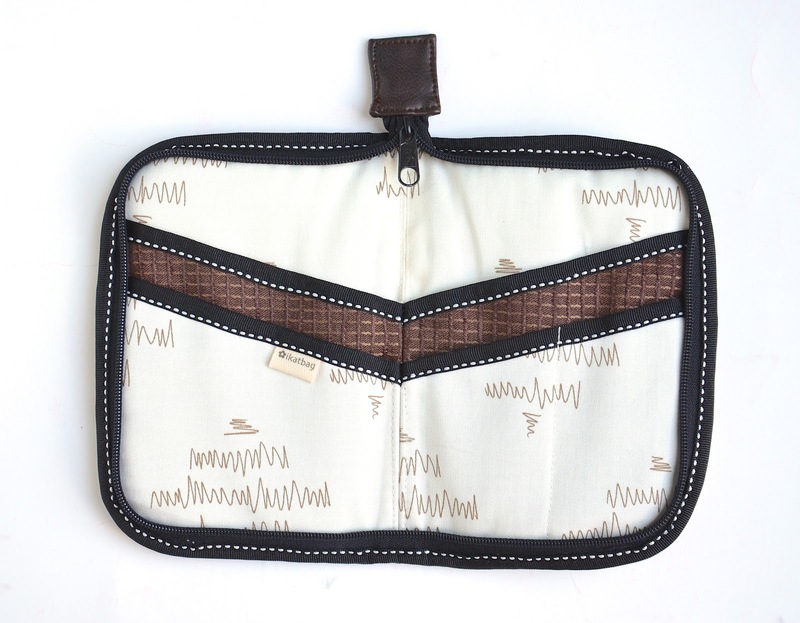 Then slide the zipper pull off the coils and match that midpoint to the bottom of the fold line of the body panel. 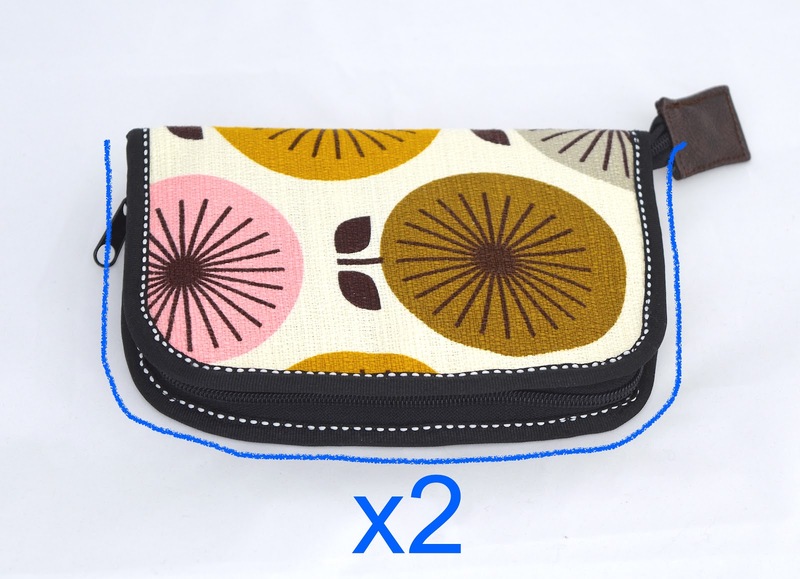 This is to ensure the zipper is installed symmetrically. 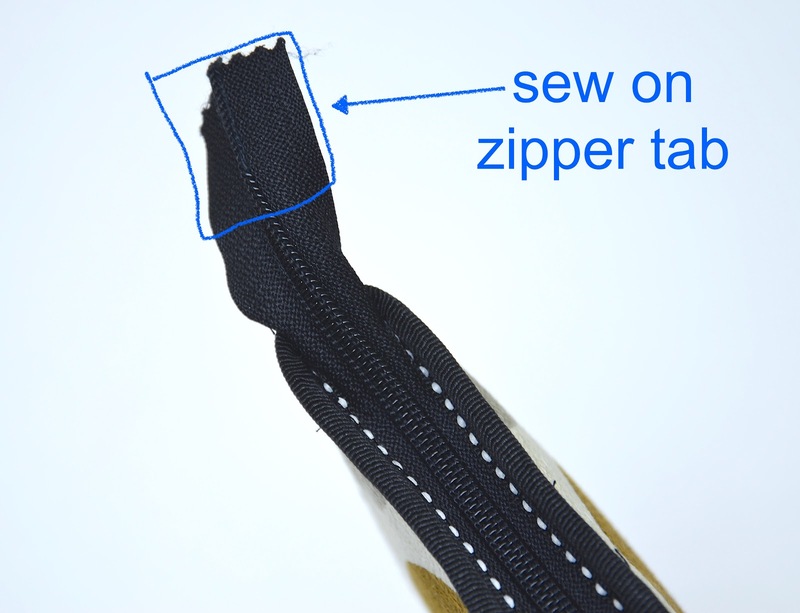 This mid-point is where you'd normally expect the end stops of a zipper to be, but we don't need them with this method of installation. 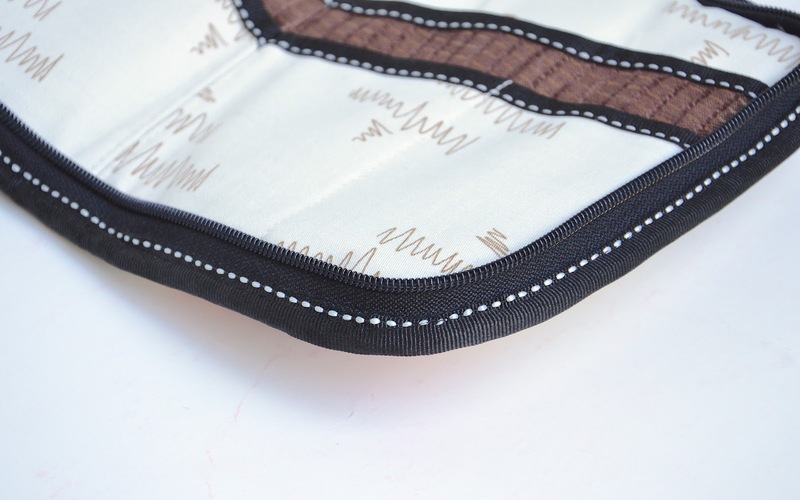 With the lining side facing up, lay the WS of the zipper on the lining fabric. Sew/baste all around the edge of the body panel to attach the zipper tape. 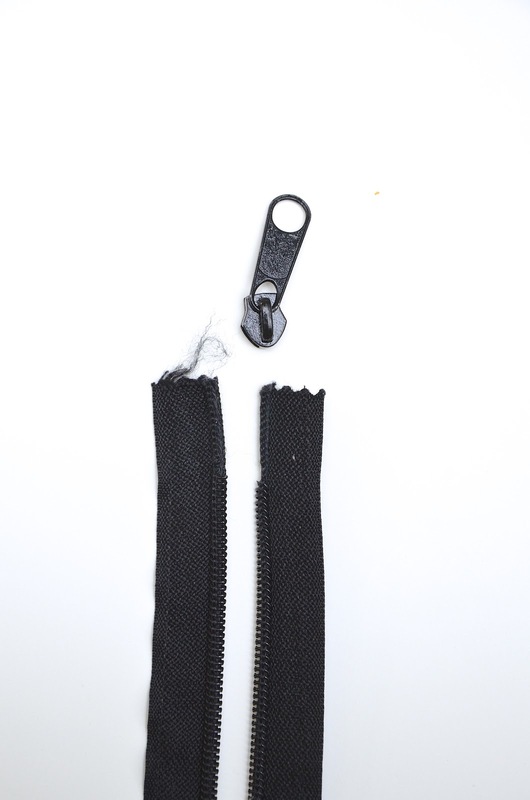 Notice the snips in the SA region of the zipper tape where it goes around the corners. 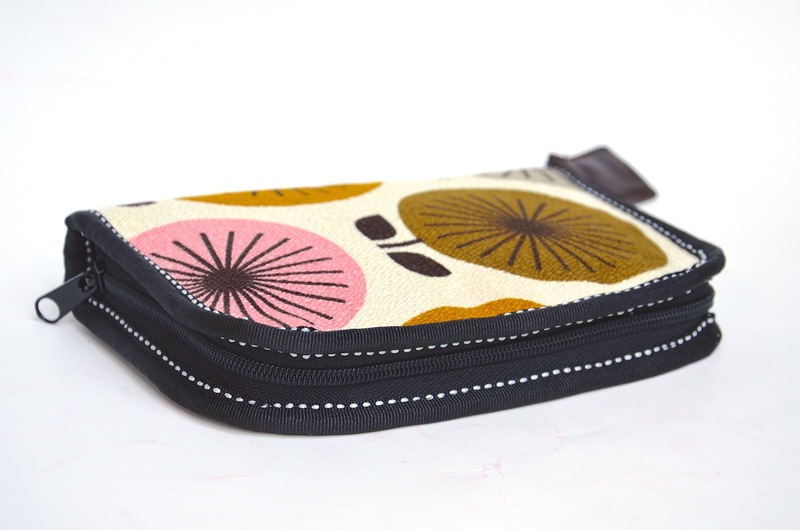 This allows it to hug the corners without pulling or bunching, and lies flat for binding in the finished case/pouch. Here's the only (slightly) fiddly bit in the whole construction process. 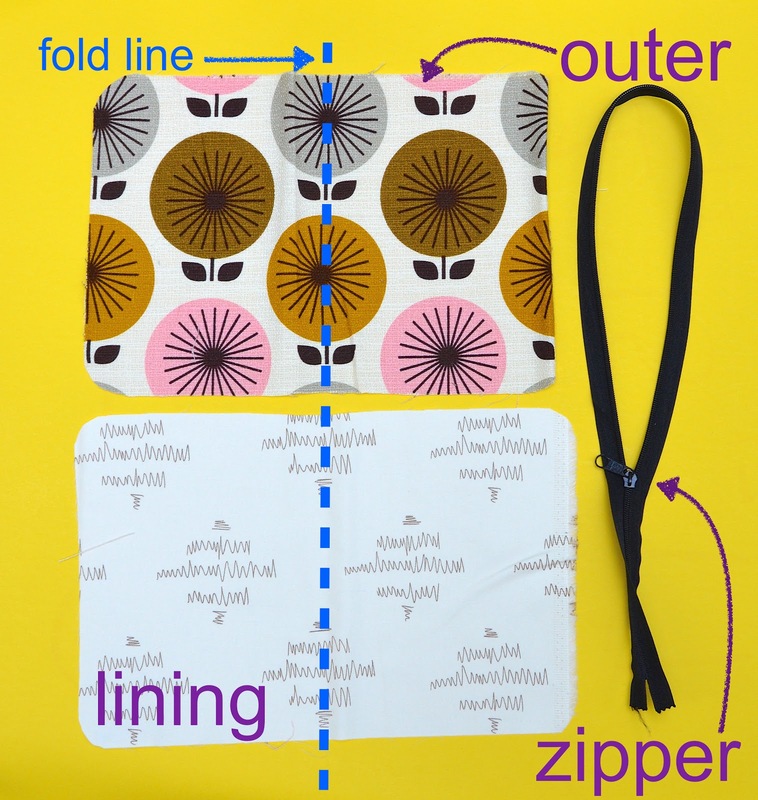 At the top of the fold line, cross the ends of the zipper tape as shown, and baste or sew across them to hold them in place. 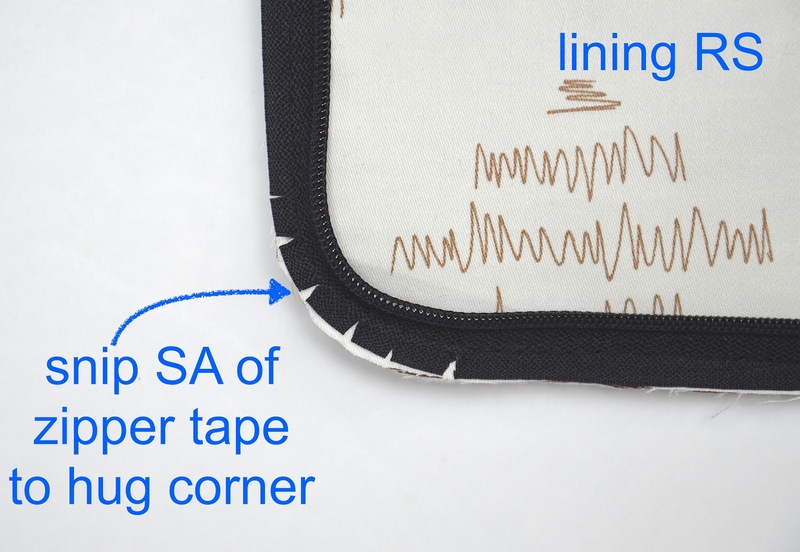 This moves the zipper tape out of the seam in that mid-point region, and allows the ends of the zipper tape to stick out of the finished pouch/case. 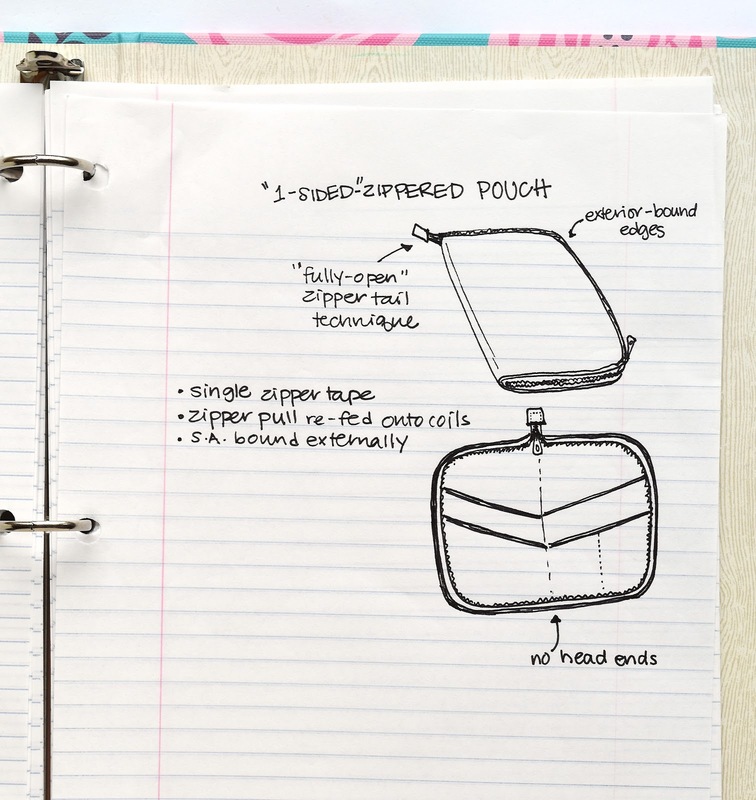 You've done this fancy maneuver before in this fully-open pouch from a few posts ago. 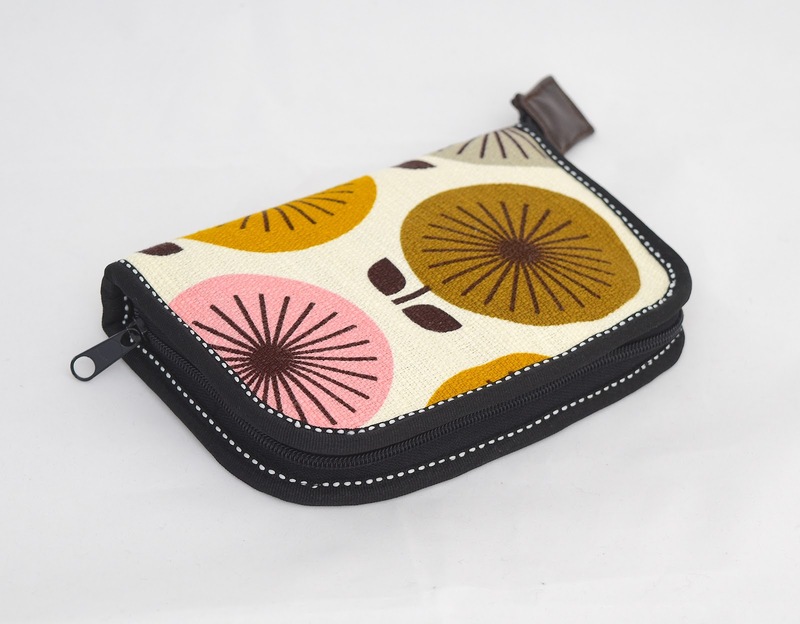 Like that pouch, this allows our case to open flat when fully unzipped. 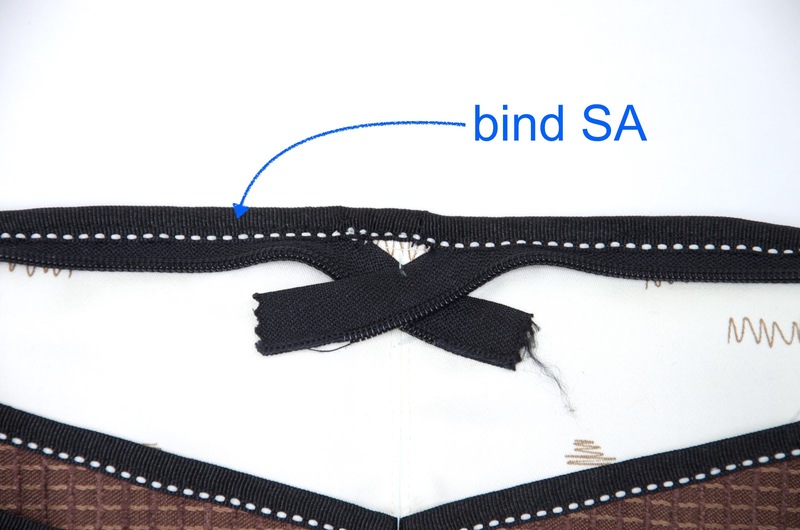 This part is trivial - simply bind the SA all around the edge of the pouch/case. Slide the zipper pull back onto the coils. Remember practising this earlier? 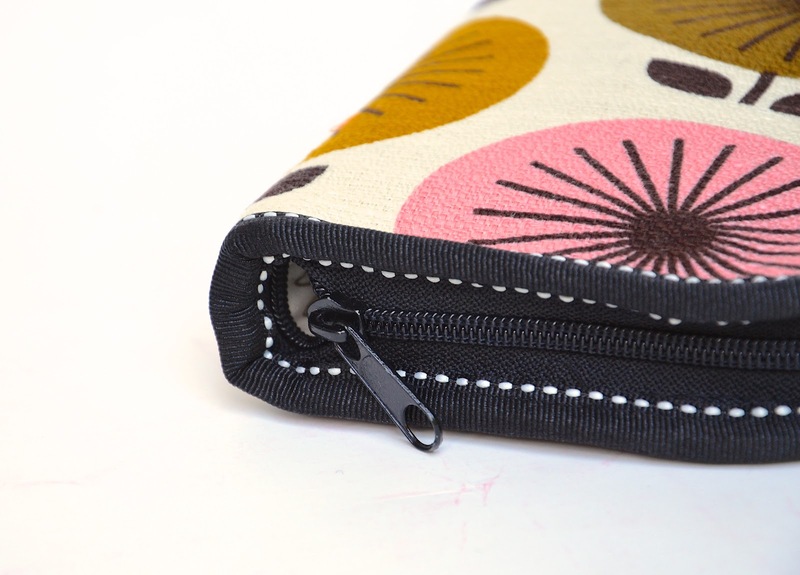 If you are so inclined, you can install a grommet in that tab, so the case can be hung from a hook. 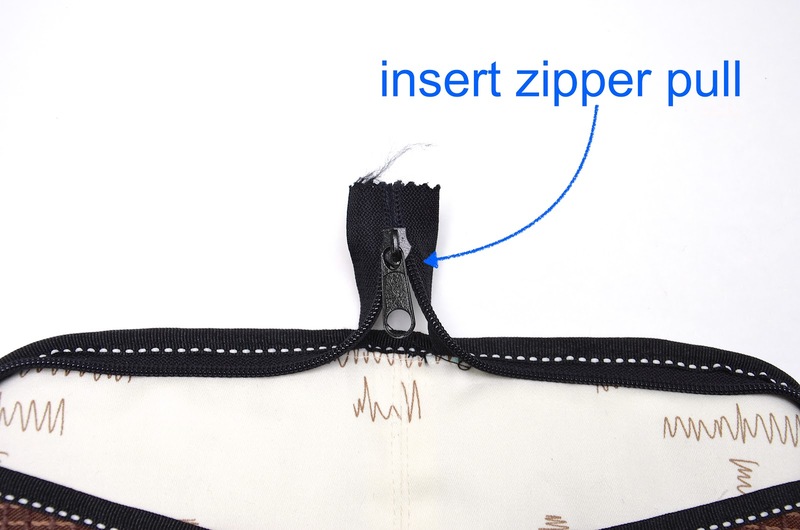 If you didn't have a long enough zipper, could you use both sides and have the bottom of the zipper dead end into the pouch and be covered by the binding?? I love these posts, and all of your very clear ideas. Thank you so much for taking time to share.